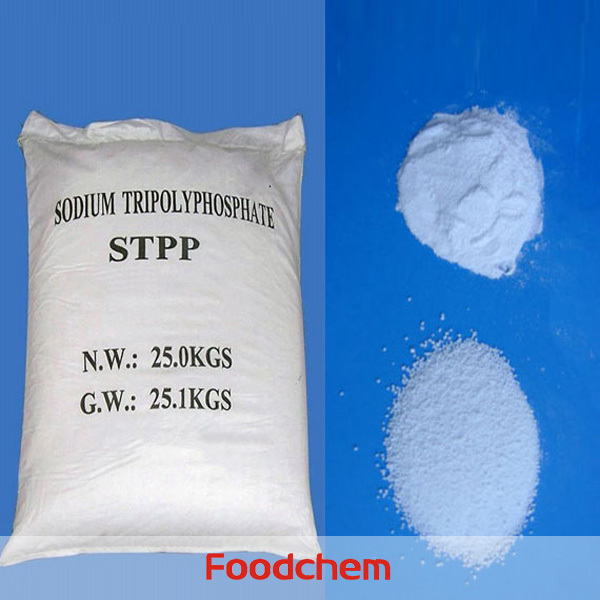 Sodium Tripolyphosphate (STPP) is one of the popular food additives and ingredients in most countries, As a professional Sodium Tripolyphosphate (STPP) supplier and manufacturer, Foodchem International Corporation has been supplying and exporting Sodium Tripolyphosphate (STPP) from China for almost 10 years, please be assured to buy Sodium Tripolyphosphate (STPP) at Foodchem. Any inquiries and problems please feel free to send emails to us via sales@foodchem.cn, we will reply you within 1 working day. Sodium tripolyphosphate (STP, sometimes STPP or sodium triphosphate or TPP) is an inorganic compound with formula Na5P3O10. Sodium triphosphate is the sodium salt of the polyphosphate penta-anion, which is the conjugate base of triPhosphoric Acid.Sodium tripolyphosphate is produced by heating a stoichiometric mixture of Disodium phosphate, Na2HPO4, and Monosodium Phosphate, NaH2PO4, under carefully controlled conditions. The uses of Sodium tripolyphosphate also include using it as a preservative. Sodium Tripolyphosphate STPP can be used to preserve foods such as red meats, poultry, and seafood, helping them to retain their tenderness and moisture. Pet food and animal feed have been known to be treated with sodium triphosphate, serving the same general purpose as it does in human food. Foodchem is an ISO2008 9001 certified company, as for Sodium Tripolyphosphate (STPP), we can offer HAPPC, KOSHER, HALAL Certificates, ect. 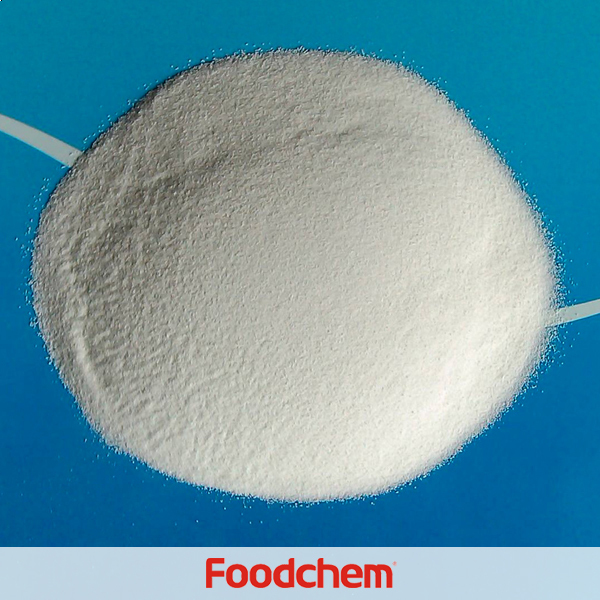 Foodchem is both manufacturer and trading company, we are Sodium Tripolyphosphate (STPP) distributor, at the same time, we are manufacturer of other products. 3, What is the Min Order Quantity of Sodium Tripolyphosphate (STPP)? Different products have different MOQ, for Sodium Tripolyphosphate (STPP), the MOQ is 500kg. 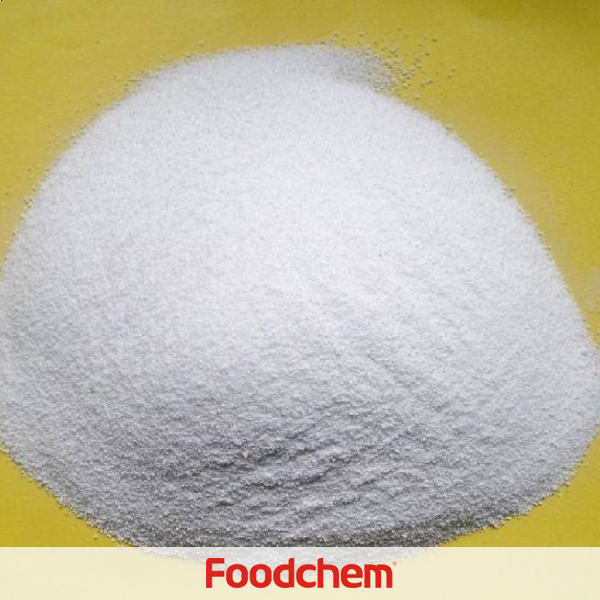 4, What is the price of Sodium Tripolyphosphate (STPP)? 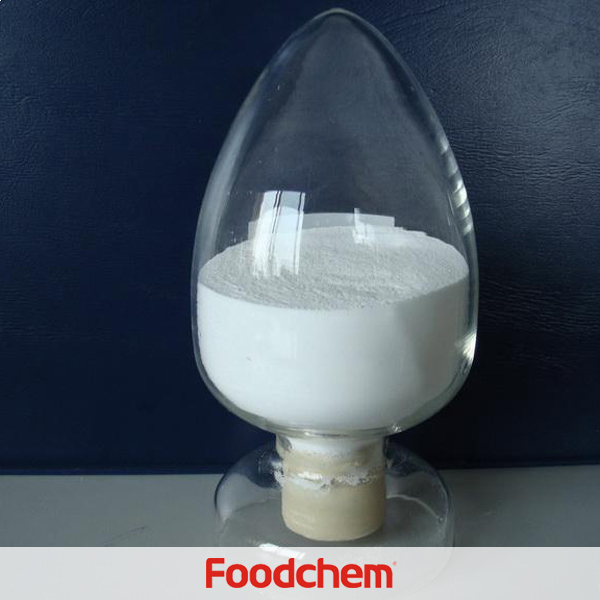 Foodchem is a famous supplier and manufacturer of Sodium Tripolyphosphate (STPP) in China, and has been corporate with many Sodium Tripolyphosphate (STPP) suppliers for several years, we can provide you with cost-effective Sodium Tripolyphosphate (STPP). We can guarantee to reply your inquiries of Sodium Tripolyphosphate (STPP) in less than 24 hours in working days. Ali MardaniQ : Hello, we are looking for Sodium Tripolyphosphate for detergent use, can you supply? 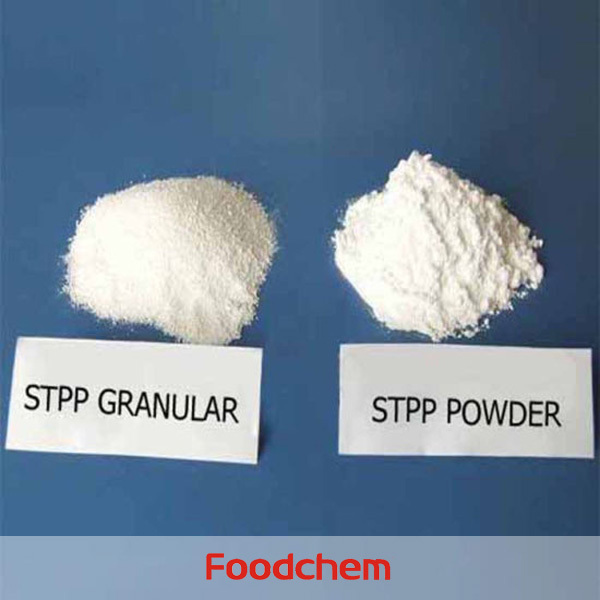 FOODCHEM A : Thanks for your interest, we have stpp detergent grade as well as food grade. Angela Low Q : Hello,i want to buy 25kg stpp, can you supply?what is the price and shippment to Thailand? FOODCHEM A : Thanks for your inquiry, but our min order of stpp is 1000 kilograms, im afraid your order is too small,maybe you can buy is local shop or raise you order quantity. Raphael Lia Admoni Q : Hello,we are looking for Sodium Tripolyphosphate to import directly to South Africa,can you do that? FOODCHEM A : Glad to hear from you,we would be honoured if your esteemed company give us the chance to provide our high quality sodium tripolyphosphate,besides,we have been exporting to Africa for years,so exporting won't be a problem. 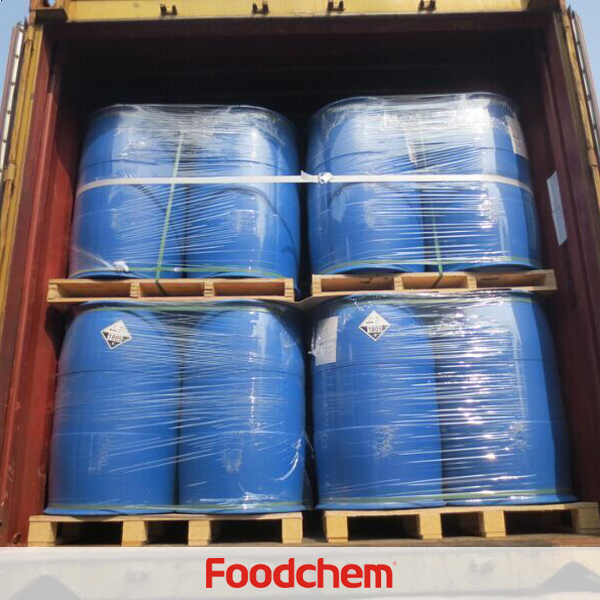 FOODCHEM A : Well,thanks for you inquiry about stpp,we have send your message to our sales manager, she will reply you and give you the quote as soon as possible in 12 hours.Have a nice day! William RippenQ : Need 3 fcls -75 mt Sodium TripolyPhosphate Food grade FOB China What would be the delivery time? 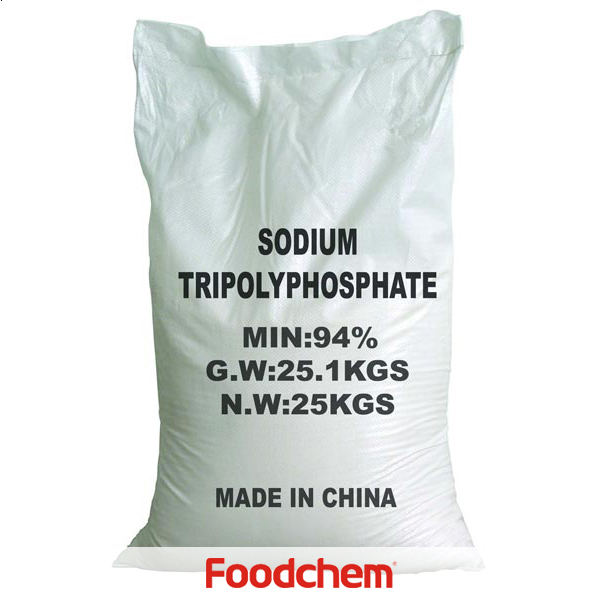 FOODCHEM A : We now have Sodium Tripolyphosphate in stock,the delivery time will be 7-10 days. EdwardQ : STPP detergent grade,do you have it? 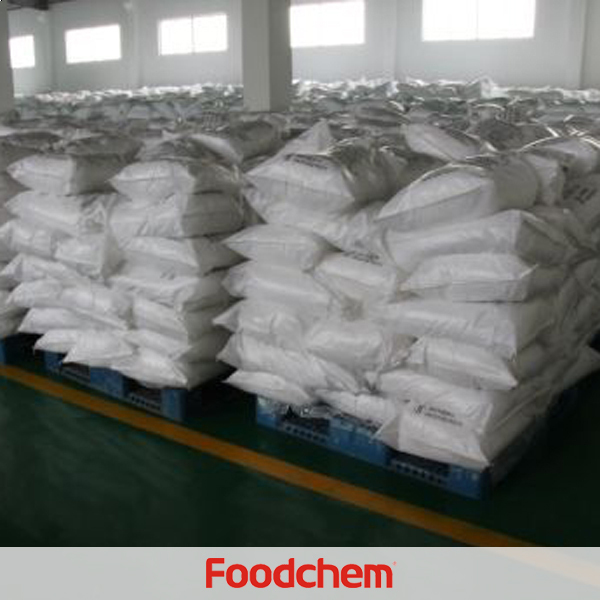 FOODCHEM A : yes, we have both food grade and industrial grade Sodium Tripolyphosphate.